On June 1, 2018, at 7:30 p.m., the ceremonial hall of the Laza Kostić high school played host to the Folk Dance Department of the Ballet High School in Novi Sad. The performance was a showcase of what the students — as well as their teachers — have been working on and preparing over the past school year. The entire department faculty was involved in the preparations: folk dance teachers Slaviša Đukić and Miroslav Savić; Bojan Milinković and Ivan Marković, in charge of the music; traditional singing teacher Mirjana Raić Tepić; teacher Marko Dubovac, who prepared the introduction and the accompanying video material; and traditional music teacher Nebojša Burić. Several local culture and arts associations gave a helping hand, providing the school with folk costumes from their collections. Although a local folklore ensemble was performing that same day, no seats were left empty. The audience was made up mainly of the students’ family members and friends. The professional community focused on the phenomenon of traditional music and dance did not attend the Ballet High School’s performance this time. As for the program itself, the performance included a total of ten acts. Some were in the form of traditional dance choreography, while others were singing and playing pieces — Miroslav Suzić performed the reaper’s dance on the flute. The traditional dance choreographies were intertwined, with no major story plots. Each act was announced by a video. The videos were a true revelation, in terms of announcing a specific act, as well as in terms of the production, which expressed some modernist tendencies. On the one hand, the video announcements were made up of edited ethnographic films — some were played backwards, others had duplicated shots, etc. On the other hand, the videos included also footage of the Ballet High School classes, also edited in similar ways. The audience was able, at least briefly, to see what the school classes look like and what exactly goes into creating this art form — the art of stage presentation of traditional dance. However, what attracted the most attention — and what I would devote the remainder of this short review — was the first piece, the introduction, called Intro/Impro. The act was performed together by the students of the second grade of the Contemporary Dance Department and students of all four grades of the Folk Dance Department. Intro/Impro consisted of elements of traditional dances performed in the contemporary dance genre. The accompanying music was a composition combining two mixed pieces. The first was the traditional song “Girl Against the Sun,” („Devojka se suncu protivila”) performed by Svetlana Stević, while the other was a piece of contemporary music. The dance part of this act was arranged by teacher Marko Dubovac. This was followed by the Folk Dance Department students joining the stage, singing “Three meadows without a shade” („Tri livade, nigde ‘lada nema”), prepared by teacher Mirjana Raić Tepić. Both acts formed an Intro/Impro choreography segment whole. The introductory piece that I mention perhaps would not have sparked so much attention or seemed as a different arrangement if it was not contextualized in the contemporary Serbian traditional dance choreography. Only then does it adopt drastically different connotations, transforming from a display of traditional dance elements in the form of contemporary dance into a mechanism of change. However a small one, but certainly a mechanism affecting the further course. Without any intention to delve deep into the development of traditional dance choreography staging — an area I believe is not yet sufficiently explored — I will briefly look at the most important moments in its history. Serbian ethnochoreology, just as many other humanities and social sciences in the region, emerged from the nineteenth-century romanticism that had long guided its course and action. Two of the first ethnochoreologists in our region, Ljubica and Danica Janković, were guided by such ideas and insisted that folk dance should be performed as they were notated in context. They saw mixing folk dance with ballet techniques or gymnastics as an act that loses the folk dance character. For this reason, one of the first Folk Dance Festivals, which took place in Belgrade in 1938 over two weeks, and any performance by “original” rural groups at it were seen by these scholars as something necessary, believing that the festival was a place that promoted non-stylized folklore. This precise time period, the 1930s, is considered to be crucial for the forming of the folk dance stage presentation model. At that time, this was done by rural groups, which showcased “non-stylized,” “original” folklore, and this became the paradigm that has remained a survival of European romanticism to this day. Despite some minor changes between the Second World War to the breakup of Yugoslavia — in the sense that the Yugoslav folklore presented at the time celebrated the collective identity — after the country broke apart, the situation reverted. Since 1991, culture and arts associations again started to be nationalized, and those devising traditional dance choreographies again strived to present “authentic,” “original” folklore. These tendencies – “preserving tradition” through traditional dance choreographies (while begging the question of what/whom is it guarded from) — largely undermine the evolution of art. The traditional dance choreography staging cannot be the same as museum preservation of artifacts, nor is the stage a place that can withhold its static presentation. Indeed, this is the exact significance of this small driving mechanism titled Intro/Impro. 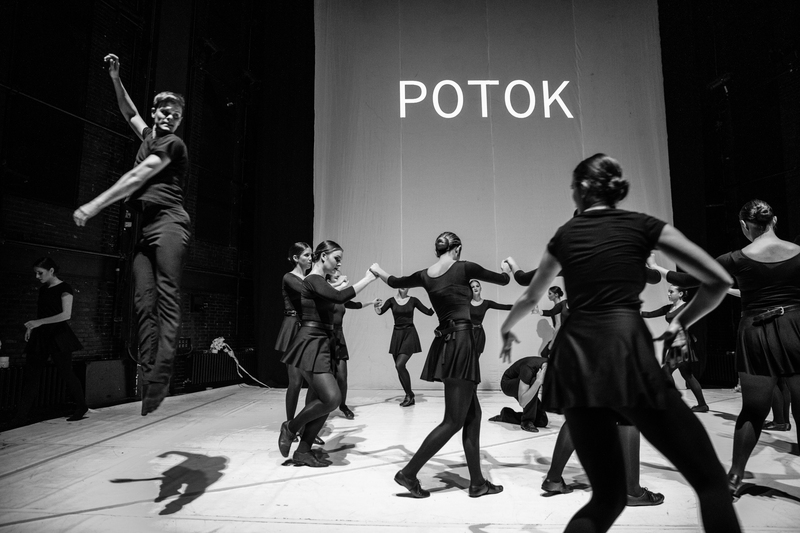 The Ballet High School teachers Marko Dubovac and Mirjana Raić Tepić have shown how folk dance can and should be viewed and treated as a form of art. This truly is an art form that much more contributes to overall identity politics only if it is equal with other art dance forms, such as ballet, contemporary dance, and so on. Otherwise, the tradition we are trying to “seize” will seize our room for action and — instead of evolving art, just as many other museum artefacts — folk dance will remain preserved in depots, far from the eyes of the public, exposed only to those who, from time to time, have to look at it. Hoping that there will be more artistic achievements like this in the future to direct the further course and wake the art of traditional dance choreography staging up from its millennia hibernation, the only thing left for me is to congratulate — first of all — teachers Marko Dubovac and Mirjana Raić Tepić, and then also all the other teachers and students of the Ballet High School in Novi Sad on their performance.